Interference drag is generated by the collision of airstreams creating eddy currents, turbulence, or restrictions to smooth flow. For instance, the airflow around a fuselage and around the wing meet at some point, usually near the wing’s root. These airflows interfere with each other causing a greater drag than the individual values. This is often the case when external items are placed on an aircraft. That is, the drag of each item individually, added to that of the aircraft, are less than that of the two items when allowed to interfere with one another. Form drag is the drag created because of the shape of a component or the aircraft. If one were to place a circular disk in an air stream, the pressure on both the top and bottom would be equal. However, the airflow starts to break down as the air flows around the back of the disk. This creates turbulence and hence a lower pressure results. Because the total pressure is affected by this reduced pressure, it creates a drag. Newer aircraft are generally made with consideration to this by fairing parts along the fuselage (teardrop) so that turbulence and form drag is reduced. 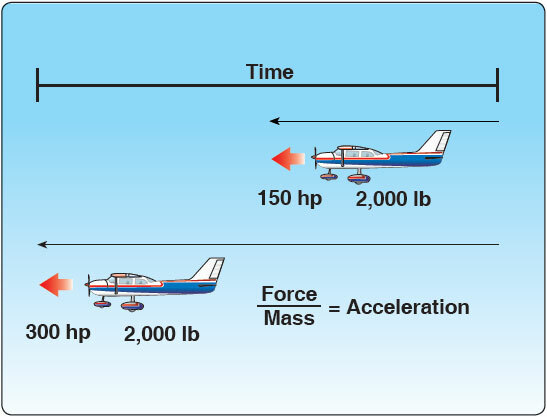 Total lift must overcome the total weight of the aircraft, which is comprised of the actual weight and the tail-down force used to control the aircraft’s pitch attitude. Thrust must overcome total drag in order to provide forward speed with which to produce lift. 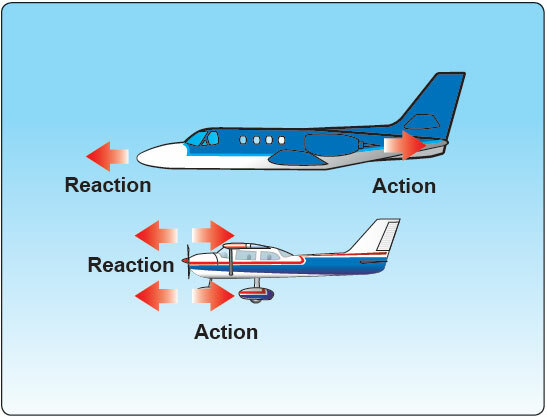 Understanding how the aircraft’s relationship between these elements and the environment provide proper interpretation of the aircraft’s instruments. Figure 4-5. Newton’s Second Law of Motion: the Law of Momentum. Figure 4-6. Newton’s Third Law of Motion: the Law of Reaction.